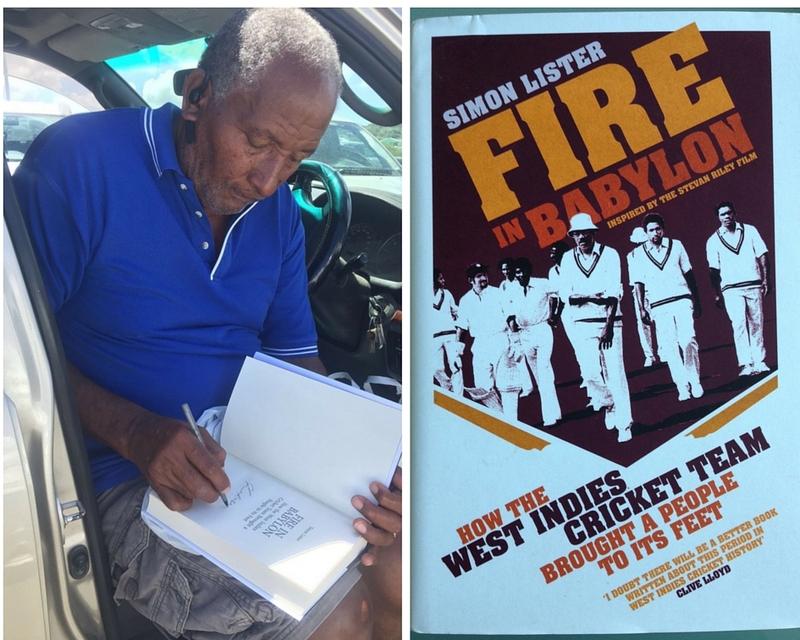 Yellow Jersey Press has kindly donated 10 copies of the cricket bible, Fire in Babylon: How the West Indies Cricket Team Brought a People to its Feet by Simon Lister. Signed by Sir Andy Roberts they are £20 (RRP is £18.99) plus £3.50 postage and packaging and all funds go directly to the Club House Fund. You can get hold of one by making a donation of £23.50 (including postage) on our fundraising page or let me know you’d like a copy by emailing me – kat @ katbyles.com and I’ll save you one. 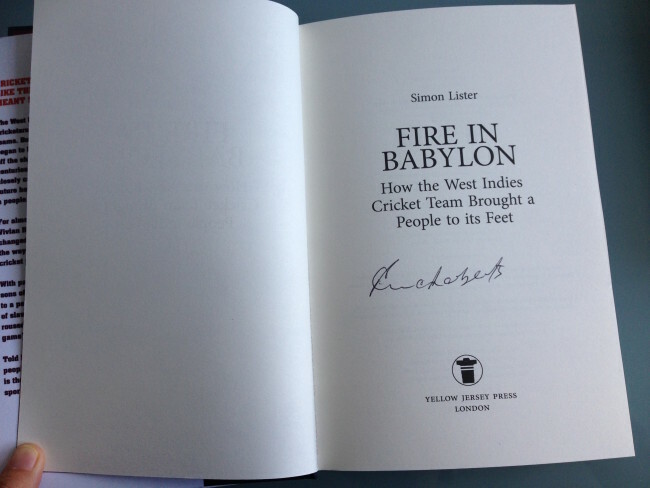 It’s a must have book for every cricket fan and a great birthday or Christmas gift. Plus you not only receive a cricket bible signed by cricket legend, Sir Andy Roberts, you directly support upcoming youth talent at the grass roots, the heart and soul of cricket in the West Indies. Here’s Andy signing the books in Antigua (March 2016)…..
“Cricket had never been played like this. Cricket had never meant so much. The West Indies had always had brilliant cricketers; it hadn’t always had brilliant cricket teams. But in 1974, a man called Clive Lloyd began to lead a side which would at last throw off the shackles that had hindered the region for centuries. Nowhere else had a game been so closely connected to a people’s past and their future hopes; nowhere else did cricket liberate a people like it did in the Caribbean. For almost two decades, Clive Lloyd and then Vivian Richards led the batsmen and bowlers who changed the way cricket was played and changed the way a whole nation – which existed only on a cricket pitch saw itself. With pace like fire and scorching batting, these sons of cane-cutters and fishermen brought pride to a people which had been stifled by 300 years of slavery, empire and colonialism. Their cricket roused the Caribbean and antagonised the game’s traditionalists. Get your copy quick with your donation here or email me – kat @ katbyles.com and I’ll reserve you a copy. PPS Please feel free to pass along to any cricket fans you know who’d love a copy!